As an online casino player, few things are more exciting than a brand new game with unique features, and that perfectly describes Ambiance - the latest addition to iSoftBet's portfolio. 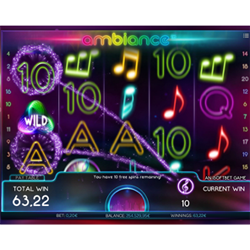 Available to play at NetBet.com, Ambiance is a stunning combination of dreamlike visual and audio effects, with 20 pay lines and a unique 'scatter and collect' feature. Pick up free spins by collecting five or more scatter symbols, and add to that total by collecting more scatters during free spin mode. You'll be entranced by musical paylines floating across the screen, which demonstrates the immense creativity on offer in iSoftBet games. The simplicity of the game allows the game developers to go all out to bring players fantastic animations, and the audio and visual elements complement each other like in few other online casino games. Ambiance is just the latest addition to a growing portfolio of iSoftBet slot games on offer at NetBet.com, including branded slots based on some of the world's most popular movies and TV shows. If you're after an atmospheric and engrossing experience when playing online slot games, then Ambiance could well be the one for you.